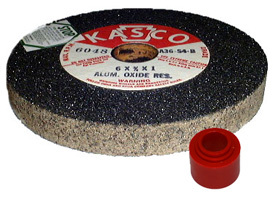 We feature resin bonded bench grinder wheels for maximum strength. If you need a larger diameter wheel (we make up to 14" diameter x 2" wide) or a different grade, please email us or telephone us at 1-800-367-7291. Reducing bushings are included with each wheel. For wheels 8" and under the bushing includes 3/4", 5/8", and 1/2" arbor hole size. For 10" wheels the bushing can convert the 1-1/4" arbor to 1". You can also order extra bushings as noted in the table below.